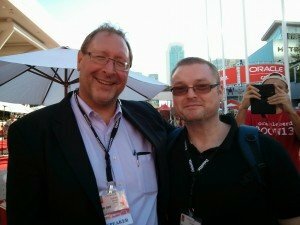 Just a quick post to remind people coming to UKOUG Tech13, you can also register for OakTable World UK 2013. If you go to the page you can see the agenda and the registration form. The event is free, but you need to be registered for UKOUG Tech13! Just a quick plug for an upcoming OTN tour, that I’m not on this year. Like any conferences, these events are all about the attendees, so the more people that turn up and the more vocal the attendees, the better the events are. I’ve seen the agendas for the Auckland and Perth events and they look cool. I hope everyone has a good time! Author Tim...Posted on October 25, 2013 Categories OracleTags 2013, ace, aced, DOUG, Nordic Tour, Oracle, orcan, otn, OUGN3 Comments on OTN Nordic Tour 2013 – It’s a wrap! Thanks to everyone that came to my presentations in Denmark, to DOUG for inviting me and giving me loads of sweets. 🙂 Thanks also to OTN and the Oracle ACE Program for helping to make this happen. I didn’t sleep too well the night before the Stockholm event, so I woke up feeling extremely groggy. I think it was just the combination of excitement and adrenalin you get before starting a tour. I met Lonneke and Sten for breakfast, then headed on to the conference venue. After those two sessions, I presented three sessions in a row, including my first ever WebLogic presentation. Eeeccckkk! I made it very clear I was not an expert! The approach was, this is what I wished I had known in my first hour of learning WebLogic! I think it went well. I got some helpful feedback from Lonneke, which I’ve added to the presentation. After my last presentation we went straight from the conference to the airport. There was a problem with the boarding scanners, so we had to be processed manually, which meant we were about an hour late in departing. That meant we were too late to have dinner with the Danish OUG folks, which was a pity. So it was straight from the airport to bed. I got up this morning in plenty of time to get to the airport to fly to Sweden to begin the OTN Nordic Tour 2013 tomorrow. I then proceeded to wait and wait and wait for the taxi. Eventually it did arrive, but now the rush hour traffic had started to build up, so time was ticking by and we were standing still for a very long time. I tweeted that I would probably miss my flight and I really believed I would. I’ll be representing the Oracle ACE Program as part of the OTN Nordic Tour this year. I’ve just booked my flights, so in a little over a week I’ll be starting the three date tour. I got up late, so I missed the morning gym session. I spent most of the afternoon in the OTN Lounge geeking out with a variety of people. I was initially expecting to spend the whole day in presentations, but it turned out I didn’t manage to get to a single one. I spent some time chatting with the ladies and gents from the RAC SIG about ideas for future directions for user groups and collaborative efforts like RAC Attack. It’s interesting to hear the different opinions and motivations of the people involved. From the OTN Lounge the next stop was the “It’s a Wrap” party, where I had an emotional reunion with my dad. I’m still waiting for the 44 years worth of birthday and Christmas presents he owes me! A big thank you to all the people involved in making RAC Attack happen again! A lot of people helped in making the new 12c install notes. Lots of people dedicated two days of OOW2013 to this, rather than watching presentations or swanning off to the boat racing. Thanks also to the OTN crowd for giving up so much space to us. After RAC Attack I popped in to see John Beresniewwicz and Kellyn Pot’Vin presenting, “Active Session History Deep Dive: Advanced Performance Analysis Tips”. I like listening to both these speakers! During the event, I managed to find Nemo and watch Maroon 5 and The Black Keys. Adam Lavine from Maroon 5 has a really strange voice. When he sings it sounds fine, but when he talks he sounds like he’s been hitting the helium balloons. It’s like Alvin and the Chipmunks. Very odd. I’m not a fan of Maroon 5, so I was surprised that I recognised all but one of the songs they played. They were really good. The Black Keys where a lot heavier than I expected. I knew I had heard some of their stuff, but I wasn’t sure how much I would recognise. I think there were three songs I definitely recognised. Pretty cool.